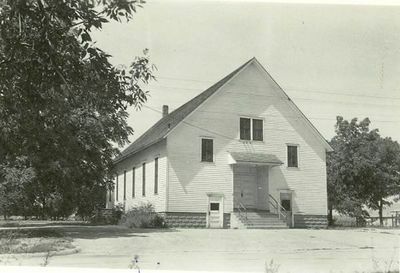 Cedar Creek Mennonite Church in Manson, Iowa on 19 August 1948. Source: Mennonite Community Photograph Collection, The Congregation (HM4-134 Box 1 photo 010.6-15a). Manson Mennonite Church (formerly called Cedar Creek Mennonite Church), is located in Manson, Calhoun County, Iowa. A member of Mennonite Church USA and the Central Plains Mennonite Conference (formerly Iowa-Nebraska Mennonite Conference), Manson was organized in 1898 by settlers from Woodford and Bureau counties, Illinois. In 1903 the first meetinghouse was built, called the Cedar Creek Mennonite Church. In 1913 a larger church was erected in northwest Manson. The name Cedar Creek was never officially changed, but this congregation became known as the Manson Mennonite Church. Missionary emphasis has generally prevailed as is evidenced by the fact that up to 1950 approximately 52 members were received from non-Mennonite homes. Minnie Swartzendruber Graber, Don McCammon, Wilbur and Grace Nachtigall, and Marie Kauffman were missionaries sent out from this church. Others have been volunteers. The 1953 membership was 264. Edward Birkey and Nicholas Stoltzfus were serving in the ministry of the congregation at that time. By 1956, more space was needed and a brick building was built south of the wooden 1913 structure and was dedicated in 1957. In June 1979, a tornado ripped through Manson, demolishing much of the town, including the sanctuary. For the next two years, services were held in the Manson Catholic Church. In June 1981, the present building was completed. In August 1997, the church celebrated its 100th Year Anniversary. In 2004 the membership was 127. Hege, Christian and Christian Neff. Mennonitisches Lexikon, 4 vols.Frankfurt & Weierhof: Hege; Karlsruhe: Schneider, 1913-1967: v. I, 336. Manson Mennonite Church. "Our History." 2011. Web. 28 March 2014. http://mansonmennonite.com/our-history. Stoltzfus, Nicholas. 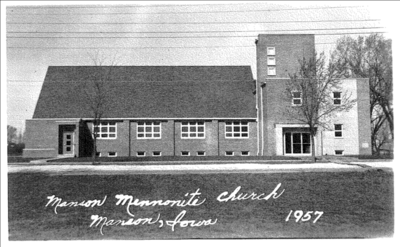 "Manson Mennonite Church (Manson, Iowa, USA)." Global Anabaptist Mennonite Encyclopedia Online. 1953. Web. 20 Apr 2019. http://gameo.org/index.php?title=Manson_Mennonite_Church_(Manson,_Iowa,_USA)&oldid=144329. Stoltzfus, Nicholas. (1953). Manson Mennonite Church (Manson, Iowa, USA). Global Anabaptist Mennonite Encyclopedia Online. Retrieved 20 April 2019, from http://gameo.org/index.php?title=Manson_Mennonite_Church_(Manson,_Iowa,_USA)&oldid=144329.